Honorees are Chef Lidia Bastianich, Vincent Boccia, president, Confindustria; Giovanni Caforio, M.D., chairman/CEO of Bristol-Myers Squibb; Antonio De Matteis, CEO, Kiton; Cav. Lav. Vito Pertosa, founder, Angel Group; and Carl Schramm, an American economist and entrepreneur. 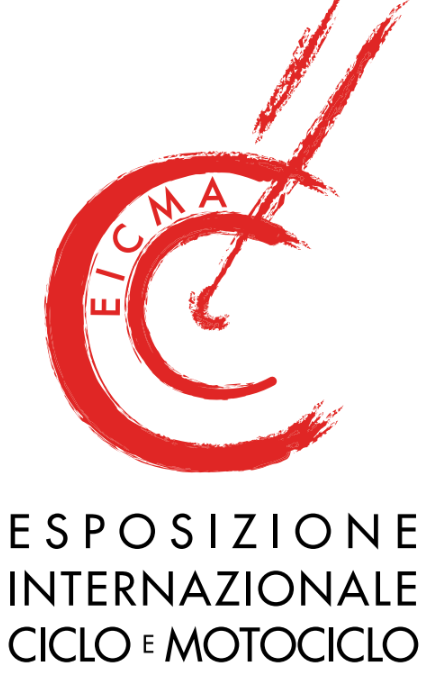 The NIAF 2018 Gala is sponsored among others by EICMA (Esposizione lnternazionale Cicio Motociclo e Accessori) the most important trade fair event for bicycles and motorcycles in Italy. 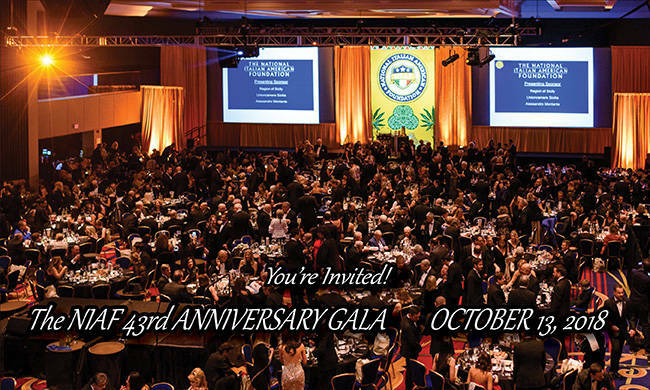 The National Italian American Foundation (NIAF) 43rd Anniversary Awards Gala, October 13, at the Washington Marriott Wardman Park Hotel, will recognize a select group of distinguished honorees who have contributed at the highest levels in business, science, the arts, and government. Honorees are Chef Lidia Bastianich, Vincent Boccia, president, Confindustria; Giovanni Caforio, M.D., chairman/CEO of Bristol-Myers Squibb; Antonio De Matteis, CEO, Kiton; Cav. Lav. Vito Pertosa, founder, Angel Group; and Carl Schramm, an American economist and entrepreneur. Bastianich grew up behind the Iron Curtain in Pola, a small city on the southern tip of the Istrain Peninsula. In 1956, her family escaped across the border to Trieste, Italy, where they spent two years in the refugee camp of the Risiera di San Sabba, its barracks once a Nazi concentration camp. In 1958, the family flew to New York. Although she initially struggled to open her flagship Manhattan restaurant, Felidia, Julia Child and James Beard famously visited for dinner and went on to help launch her television career. Bastianich is an Emmy-award winning public television host, a best-selling cookbook author, a successful restaurateur, and owner of a flourishing food and entertainment business that includes being a partner in the famous Eataly USA. Boccia, a native of Salerno, is CEO of Arti Grafiche Boccia and current president of Confindustria. The family business, based in Salerno, began as a manufacturing company specializing in the printing of periodicals, newspapers, books and pamphlets for large retailers. It is now an international company with offices in France, Germany, Denmark, and Lebanon. The company is known for its innovation in processes and products, and research in developing new solutions for the ever-changing market conditions, resulting in a high rate of success not typically seen in this traditional industry sector. Born and educated in Italy, Caforio has led Bristol-Myers Squibb in advancing its vanguard position in oncology, immunoscience, cardiovascular disease, and therapies for fibrotic diseases. He was appointed as CEO in 2015 and elected as chairman of the board of directors in 2017. His leadership has been marked by a strengthened patient-focused culture, emphasizing the power of innovation, speed, accountability and passion. He has also led the company’s drive to expand its global reach and is a champion for biomedical innovation and greater patient access to novel therapies. Born in Naples, De Matteis started his career as an agent with his uncle, the founder and president of the company that has become Kiton. In 2007, he was named chief executive officer. Under his leadership the company enjoyed constant growth, employing 750 employees with 47 flagship stores worldwide. His career stands out for its extraordinary and constant impulse towards research and innovation in the textile and stylistic fields. His studies have led to the development of an exclusive system designed to produce Pure Vicuña yarn and Summer Vicuña, the first ultralight fabric to be made from this precious material. In 2018, De Matteis introduced KNT (Kiton New Textures), the first collection signed by his sons. Born in Monopoli (BA), Pertosa is founder of Angel, an industrial holding company with a high technological content and a presence in 60 countries. He is chairman and controlling shareholder of the MERMEC Group, a world leader in the development of railway equipment and technology. He is the former director of the Italian Space Agency (ASI); member of the National Technical Innovation and Research Committee of Confindustria; CEO of the South Space Consortium; and sole director of the 2M CLIV Consortium. He was also a scientific expert for the Italian Ministry of Education and the Ministry of Economic Development, as well as regent for the Bari Branch of the Bank of Italy. Among the several other positions in which he has advanced high technology in various industries, Pertosa was chairman of IMAGEMAP Inc.; managing director of the Laser Scarl Center; vice president of the Tecnopolis Science and Technology Park; vice president of the Procomp Research Consortium, sole director of ITEL Italiana, and president of the Argenta Group. Schramm is University Professor at Syracuse University and former president of the Ewing Marion Kauffman Foundation, the world’s largest philanthropy dedicated to promoting entrepreneurship. He is recognized internationally as a leading authority on innovation, entrepreneurship, and economic growth. Dr. Schramm’s academic career began at Johns Hopkins, where he founded the nation’s first research center on healthcare finance. He has founded or co-founded five companies, including HCIA and Greenspring Advisors. From 2009 to 2012, he served as a member of the Singapore Prime Minister’s Research, Innovation, and Enterprise Council. He chaired the U.S. Department of Commerce’s Advisory Committee on Measuring Innovation in the 21st Century Economy and was a member of the President’s National Advisory Council on Innovation and Entrepreneurship. This year, the awards were created by Dante Mortet, a sixth-generation sculptor based in Rome whose family have helped create works of art for more than 100 years, including the Sword of Victory for Victor Emmanuel III; the Door of the Reliquary of the Holy Sepulchre in Jerusalem; and the lamps kept in the Pantheon for the tomb of Queen Margherita of Savoy. This year’s award is a sculpture fittingly honoring the Italian genius Leonardo da Vinci. The 500th anniversary of his death is in 2019. 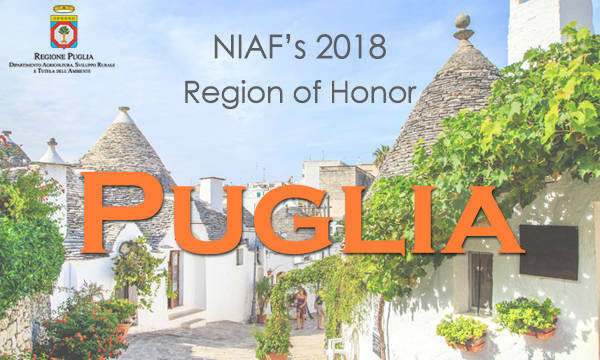 On Friday evening, join Bastianich for an intimate three-course dinner and wine pairings featuring cuisine inspired by Puglia, which is the NIAF 2018 Region of Honor. Bastianich also will be available to sign her latest book, My American Dream: A Life of Love, Family, and Food. The Expo Italiana, which is free and open to the public all day Saturday, features more than 60 Italian American and Pugliese exhibitors, offering wine samples, specialty foods, travel opportunities, and more. Attendees can see a special presentation on Luigi Del Bianco, chief carver of Mount Rushmore; watch the three grant finalists’ films for The Russo Brothers Italian American Film Forum; learn to speak some basic Italian phrases; and enjoy a gelato demo and tasting from Gianluigi Dellaccio, owner of Dolci Gelati. On a limited basis, a free lunch will be provided by Clemente Bakery, a famed Italian deli in South Hackensack, N.J.